BlackBerry goes Pink for Verizon | BlackBerry Blast! Verizon Wireless and Research In Motion announced today the availability of the BlackBerry® Pearl™ 8130 smartphone in pink. 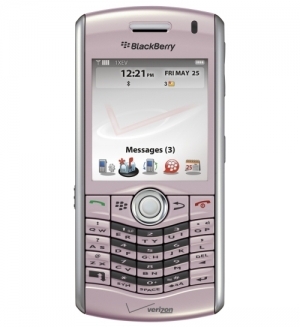 Coming to Verizon Wireless Communications Stores tomorrow, the pink BlackBerry Pearl is packed with the same powerful communications features and wireless broadband connectivity as the original, but it comes encased in a new pink finish that’s chic and sophisticated. Perfect for the fashion-forward professional on-the-go, the BlackBerry Pearl 8130 in pink makes it easy to perform essential tasks away from the office, such as managing e-mail, and connecting instantly to the Internet, and it also lets customers take pictures, listen to music, watch videos, and much more. With built-in navigation to support the location-based application, VZ NavigatorSM, customers can get audible turn-by-turn directions to wherever they want to go.